Mexico City has invested Mexican Peso (MXN) 14.7 million – about EUR 672,000 – in bringing solar water heating to 10 public hospitals via PACCM, its Climate Action Programme 2012-2020. The aim is to reduce fuel consumption by 35 % to save MXN 4 million and 446 tonnes of carbon dioxide equivalent, or CO2eq for short. After six months, the systems totalling 1,176 m2 of collector area have already contributed over 50 % to the estimated emission savings per year. The photo shows the installation at Dr Belisario Domínguez Hospital with 276 m2. Módulo Solar used flat plate collectors tested according to Mexico’s NMX-ES-001-NORMEX-2005 standard to meet hot water demand for the hospitals’ bathrooms, laundry rooms, kitchens and staff showers. The goal had been a solar fraction of 35 % at each hospital. By end-August, solar technology had saved them 62,388 litres of LPG and 51,997 litres of diesel and had reduced emission levels by 233 tonnes of CO2eq. The systems have already contributed more than 50 % to the programme’s emission reduction target of an estimated 446 tonnes CO2eq per year (see the table below). Comparison of annual estimates and current emission savings achieved by 10 solar water heating systems at hospitals in Mexico City (*by 28 August 2018). The solar water heating systems have been connected directly to the hospitals’ water pipes and pressure levels have been adjusted to meet those of the existing storage tanks. The simplicity of direct solar water heating has made it a very popular choice in Mexico. The heat transfer fluid is the storage tank water itself. No additional heat exchangers are required. 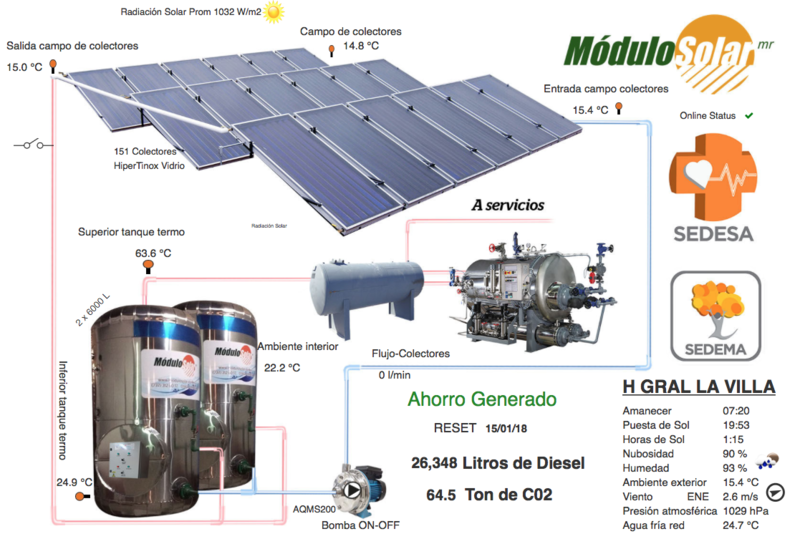 The solar thermal installation is operated in combination with the conventional system of boilers and tanks. Cold water is first preheated by the solar field. It is then fed to the storage tank of the solar water heater before being directed to the tank of the boiler. Each system is equipped with an advanced web-based monitoring unit for remote data capture in real-time. It has three components, which control the installation, measure energy output and collect additional climate data, to improve operation. The unit can analyse performance, energy savings, daily hot water consumption and climate conditions specific to each site. The control component additionally ensures that the system is protected against freezing and over-heating. 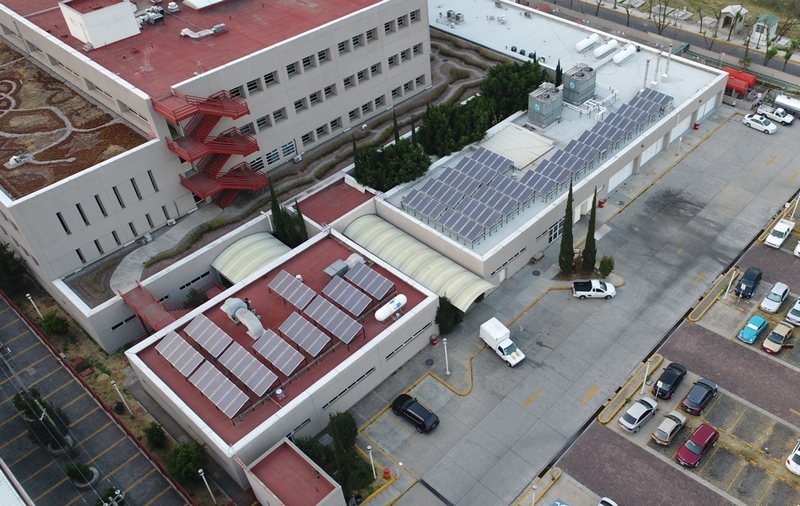 The implementation of the solar thermal programme at Mexico City’s public hospitals has been made possible thanks to the success of a pilot system financed by USAID and installed at Pediátrico la Villa Hospital in 2014. This one is also a direct solar water heating installation and consists of 32 collectors supplying water at 60 °C to hot water network. It has reduced the amount of diesel the hospital needs for heating about 10,000 litres of hot water each day by up to 40 %. In 2017, Mexico City decided to replicate the project’s success at 10 hospitals run by the Ministry of Health of Mexico City, also known as SEDESA. The retrofits are part of its Climate Action Programme 2012-2020, a scheme managed by the city’s Ministry of Environment, or SEDEMA, and supported by its Climate Change Fund known as FACC. It is expected that the new city government, which was voted into office this July and will start work in December, will continue the programme by installing another 15 solar water heating systems at public hospitals and extend the scope of the endeavour to include other types of public buildings. This text was written by Marisol Oropeza, a Mexican/German communications and marketing specialist based in Germany, who focuses on solar heat (marisol@matters.mx).